The French fashion house has released a short movie starring the British actress as Coco Chanel – watch it in full here! 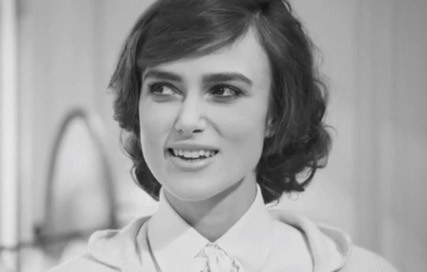 Chanel has premiered its mini-film starring Keira Knightley in full – and you can watch it here! The black and white short, titled Once Upon A Time, is written and directed by the luxury label’s creative director, Karl Lagerfeld, and stars the British actress as legendary designer Gabrielle ‘Coco’ Chanel. Released to mark the 100th anniversary of the opening of the first Chanel boutique in the French seaside town of Deauville in 1913, the film also stars actress Clotilde Hesme as Chanel’s aunt Adrienne, who helps her set up her first shop, and male model Jake Davis as her lover Boy Capel, as well as models Stella Tennant, Saskia de Brauw and Lindsey Wixson as high society figures Lady de Grey, Vita Sackville-West and Miss Vanderbilt, respectively. The movie retells the story of how Chanel first began selling hats – going against the grain of the trends at the time – attracting wealthy and stylish clients to the boutique, before selling clothes made with fabrics typically reserved for menswear, such as jersey and tweed, quickly garnering a loyal following who craved modernity. The 18-minute film was premiered in full for the first time last night in Singapore, ahead of the unveiling of Chanel’s cruise 2013 collection in the Asian city today. Watch Once Upon A Time in full above. Enjoy!